I rarely make a piece for myself, but I was invited to a wedding tonight, and wore a sweater that was in the warm-red, coral pink tones of the tiger lily. Despite a flutter of ruffles, my sweater still called for a necklace, something understated, that didn’t shout for attention. A dyed jade flower in the colors of the tiger lily became my starting point. My stash yielded some additional rounds and glass beads in warm oranges. Top-drilled peridot and a gold CZ round gave the needed contrast and shine. 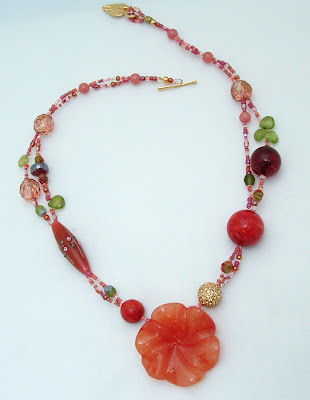 Finally, I mixed up a bead soup in analogous shades from orange-yellow to magenta. Did you notice the name of my primary seed bead in this mix? Despite the name, it’s a very agreeable, low-intensity amber that always looks good, no matter what I pair it with. It was a wonderful wedding, celebrated at the Panda Pavilion of Zoo Atlanta. A beautiful summer night, a new necklace, a good time with friends, and I’ve never seen a groom so in love with his bride! To see some truly inspired tiger lily designs, click over to the Inspired by Nature Jewelry Challenge, and prepare to be amazed by this week's challenge responses! This is very pretty! I also really like the black and gold piece that you posted in the previous blog. I love it Karin! 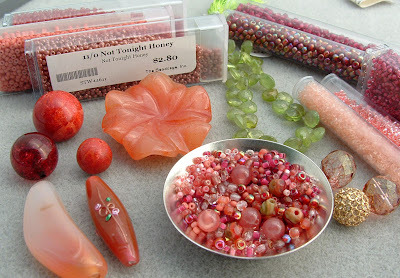 That bead mix looks a lot like the mix you sent me, the colors are gorgeous!